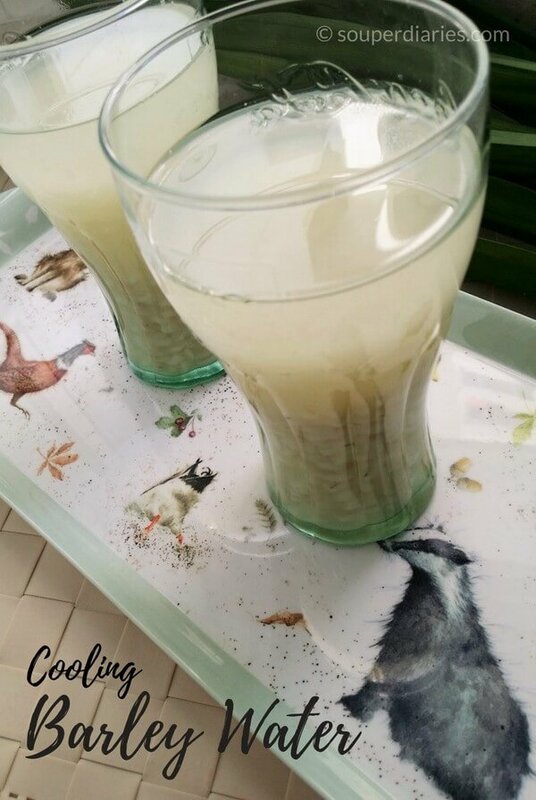 Barley water is a popular home remedy to help cool the body and beat the summer heat. So refreshing, soothing and easy to make. Good ‘ol barley water is one of my favourite “old fashioned” drinks that I’ve taken since my childhood days. 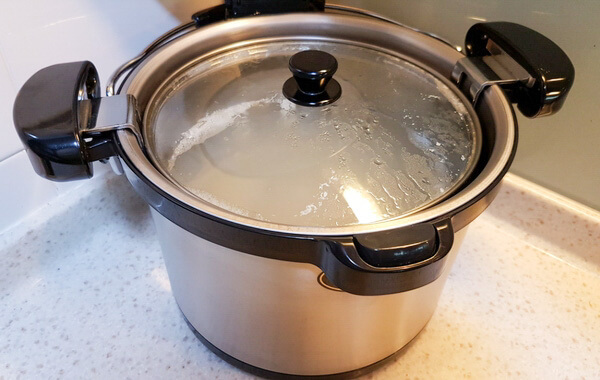 Till now, it is one of the first cooling Chinese herbal drink that I make whenever anyone in my family has a sore throat, fever or display any heat-related signs. So, before we go running off to see a doctor, we would be gulping down lots of this cooling barley drink to soothe any minor ailments. Sometimes I’ll use my thermal cooker to make this barley drink. All it takes is just 10 minutes of boiling on the stovetop before I transfer the inner pot to the thermal cooker to let it finish the cooking. It’s very convenient when I have to leave the house and there’s no one at home. For such a tiny grain, it does have a lot of nutritional value. If you feel that you’ve taken too much rich, oily and fried food, pearl barley water is great to help detoxify your body. Each time I take this drink I feel the urge to visit the bathroom more often as barley water has powerful diuretic effects. 1. High dietary fibre which helps to lower cholesterol, fights constipation and improve digestion. 2. A good source of vitamins and minerals which includes selenium, B vitamins, copper, chromium, phosphorus, magnesium and niacin. 3. Helps with weight loss as it is low in fat and calories. This cooling drink is a traditional ‘cure’ in many Chinese households for conditions ranging from sore throats to pimply skin. It reduces internal heat in the body and aids in reducing inflammation. When my son was born, a friend advised me to replace his plain water with unsweetened barley water as drinking formula milk was deemed too heaty. Some Chinese mothers use unsweetened barley water to mix with milk formula for their babies. It is believed that the cooling properties of barley water will balance the “heaty” infant formula milk. More information about the health benefits of drinking barley water can be found here. Are there any uses for leftover cooked barley grains? Most people discard the grains after drinking the barley water but I usually consume them along with the drink. My son loves them too. Use them in your pasta dishes, stew, salad, oatmeal, porridge and any of your favourite dishes. Sometimes, I keep my leftover barley grains in the fridge and eat them the next day. So what do you do with leftover barley? Do you eat them or use them for other dishes or just toss them away? Share with me in your comments below! 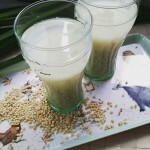 Chill down with a glass or two of thirst quenching barley water. A great drink to cool down the body. Wash and drain the pearl barley until the water is much clearer. 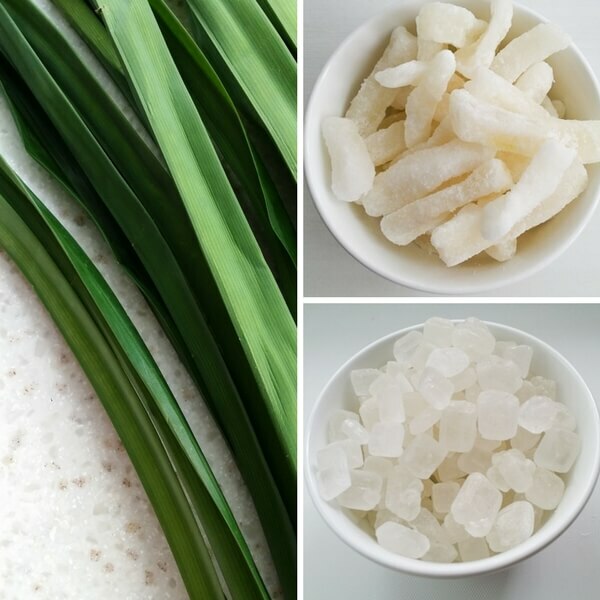 Place water, barley, candied wintermelon and pandan leaves into a soup pot and bring to a boil. Once it is boiling, lower the heat and let it simmer for about 30 minutes or so till the barley expands and softens. Top up with more water if necessary. Add in rock sugar 5-10 minutes before turning off the heat. Stir until the rock sugar is fully dissolved. Discard the pandan leaves. Serve hot. Or leave it to cool and chuck it into the fridge and enjoy it chilled. It is best to drink it on the same day you cook it. If you keep it in the fridge, finish it within 1-2 days. So, what do you do with the bundle of pandan leaves ? let them simmer too, and then take them out? Shall we drink it before our meals? 3 times per day? I’ll give it a try without them anyway, I need a detox! oh yeah… AWESOME! I’m VERY into the yin and yang (hot and cold) chinese knowledge of the power of our nutritional intake… and THIS is a good one!